Andy at Fandango Groovers has done it once again: he's put forth a true challenge to all of us film bloggers for what will likely be the coolest and most revealing blogathon of the year. He asked us to pick one year in film that we consider the best and give five films backing it up. Our choices are below, but be sure to see what everyone else has to say by going here. Not all of them have particular historical context, but the fact that Sidney Poitier's 3 movies that year (Guess Who's Coming to Dinner, In the Heat of the Night, To Sir, With Love) grossed over $115 million seems wonderfully impressive, but begs the question, how haven't we come farther with race in movies if that could be accomplished in 1967. Perhaps it was an anomaly, Poitier never had another year quite like it, and wasn't even nominated for an Oscar for any of those performances. 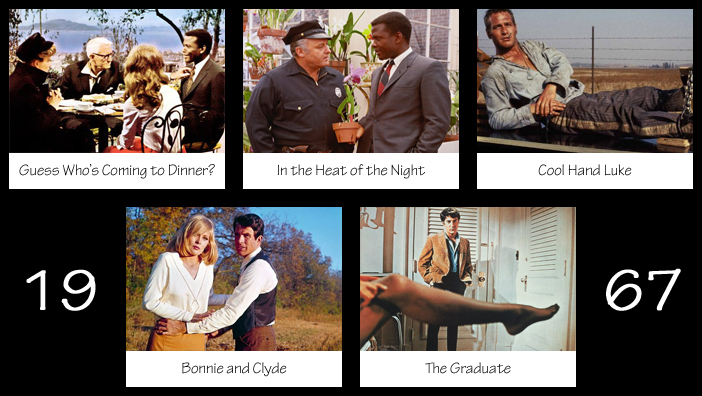 Then you get movies that became classics like Bonnie and Clyde and Cool Hand Luke. Movies that hold up after 45 years. There are movies half their age that don't hold up at all, and they had several in 1967. And finally, The Graduate. One of the greatest movies of all time - a love story, a seduction, and of course "Plastics". All of it seems prophetic in many ways - the idea of picking an industry and having all the young college graduates bumrush the field in an effort to get ahead was probably pretty new in '67, and seems old hat today. Also, the original "cougar" in the brilliant, seductive Anne Bancroft's Mrs. Robinson. Probably the best year in film. If you haven't seen any of the above, start at the top of the list and work your way down, you won't be sorry. I admit, I felt like a college freshman trying to do her first research paper when I started sifting through decades of film lists, trying to find THE year in film that I wanted to call mine. First, I tried to look at the years in which my top three films of all time were released, and sadly came up short. I was certain I hadn't seen enough of the 60's or prior to make a definitive list, so I started skimming through the 70s, finding plenty of excellent classics I respect, but not ones that were very "me." Jumping around the '80s, I encountered plenty of nostalgia, but little more than fun childhood fluff. I found myself picking one or two amazing films from the 90s and early 00's, but the rest were just good fillers. And then I found it, a year list containing film titles, one right after another that I adored, for many reasons. I then found myself with a new challenge: narrowing it down to only five movies. As a film lover, there are many things that draw me to the cinema, but at the top of the pile is the ability to leave my world behind for just a little while. From the seedy underbelly of Boston to a 19th century London filled with dark, vengeful magic. A fairytale wrapped in a warring Spanish countryside to a bleak future without children. And finally joining a roadtrip to perform in a child beauty pageant...all five of these movies have whisked me away to places I never would have imagined on my own. They have given me characters that I fall in love with every time I watch them and stories that still manage to break my heart or lift my spirits, even multiple repeat viewings later. I anticipated every single one and left the theater blown away. And while looking down the list of films for 2006, I knew my year was found. Two great choices, Jess has probably picked the better year overall but Rachel has played the trump card of picking Pan's Labyrinth, my favourite movie on the list and possibly my favourite movie of the past ten years. Happy to please! With a disturbing balance of fairtytale and harsh reality, I saw Pan's Labyrinth is a perfect example of why we go to the movies. Definitely in my Top 20 of all time. Thanks for hosting another amazing blogathon, Andy! Thanks Andy! Really great choice for a blogathon! Can't wait for the next one. Little Miss Sunshine... it's a blur for me. Saw it at a party don't remember much of it. I'll have to hunt down a copy and re-watch it. I find myself mopping up tears of laughter every time I finish that film. Any time I need my spirits lifted, I pop it in the dvd player. Definitely check it out. Love both choices. The Graduate is such a great movie, even today... I watched it for the first time last year and was hooked - it's so much better than many of the newer coming-of-age films. 2006 was also what I had chosen if I hadn't chosen 2009. I just watched The Graduate for the first time earlier this year and was amazed at how much I liked it. Definitely a classic worthy of its praise. A lot of people pick 2007 as the best recent year of cinema, but I'm with Rachel on this one. I think 2006 is the better year. Not sure I'd call it the best year of films of the sampling of films I've watched, but certainly the best of the past decade. I had a handful down for 2007, but didn't feel strongly enough about all 5 films to pick it as my year. When I started reading down 2006 releases, I had a hard time picking only 5 that I loved. I picked 2006, too, because I also think it's one of the best, if not the best movie year of the 2000s. It was a great year for movies. Nice lists from both of you. Thanks, Alan! Glad to see someone else with love for 2006. I can't get over how many more great films there were besides the five on my list. I'm afraid I've only seen one movie from 1967 but wow, 2006 definitely has some great films! LOVE The Prestige and Children of Men. Children of Men is my #4 favorite film of all time. Of all the horrific dystopian futures portrayed in film, this is one of the few, if not only, I feel that could happen, because Cuaron made the dire situation so believable. And The Prestige is probably my favorite non-Batman Nolan film. It's just so damn good. I attended the San Diego Comic Con the year before Children of Men came out. There, I went to a panel where the director Alfonso Cuarón was talking about the film. He showed the six minute long take of the film where Clive Owen navigates through a war zone. He also explained that what we saw, what would eventually be in the movie, was the last attempt before they would have had to shoot it more economically since it was extremely taxing to keep setting the scene up over and over (even the take they went with has a goof where 'blood' splashes on the camera). He also talked about how there were other long takes in the film in an attempt to give the film a quasi-documentary feel. In any case, I was sold on the movie and was not the least bit disappointed when I saw it in theaters multiple times, dragging new people to see it upon each viewing. I'm with you. Those long takes are ledgendary. I'm glad he was able to pull them off, because they help elevate the film even more for me. I too saw the film a couple times in the theater with different people. It's just that good. 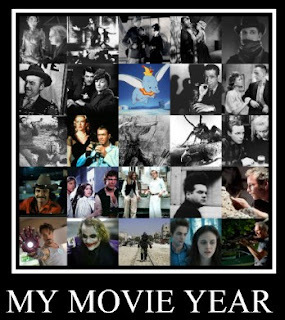 Both such dynamic years and filled with excellent movies! Thanks! It was a tough assignment, but I love the diverse results. I agree with Rachel - I knew which year I'd pick almost immediately, but I'm doing head slaps with all the years I didn't pick.